New Delhi, March 7, 2017: Kalyan Jewellers, India’s most trusted and leading jewellery brand has launched Rang, a colourful new line of precious stones jewellery. 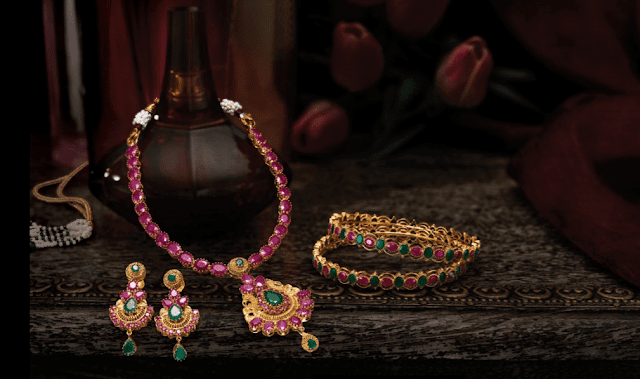 The bright and vibrant Rang collection is crafted in gold and embellished with red rubies and glorious green emeralds. This kaleidoscopic collection offers wonderful choices in the form of elegant haathphools, statement rings, bold pendants, flirty earrings, stunning raani haars, magnificent bangles and enviable necklaces.Set in contemporary and conventional designs, the eclectic collection offers the Indian woman the stone of her penchant and personifies her effervescence. Like the name suggests, Rang is bold and unapologetically original, much like the woman who adorns it. The Rang bridal set adds colour to the bride to be and makes for a perfect match to her trousseau. The collection will be available at Kalyan Jewellers showrooms across India and Middle East. Headquartered in Thrissur in the state of Kerala, Kalyan Jewellers is one of the largest jewellery manufacturers and distributors in India. The company draws from its strong roots of over a century in the business of textile trading, distribution and wholesaling. 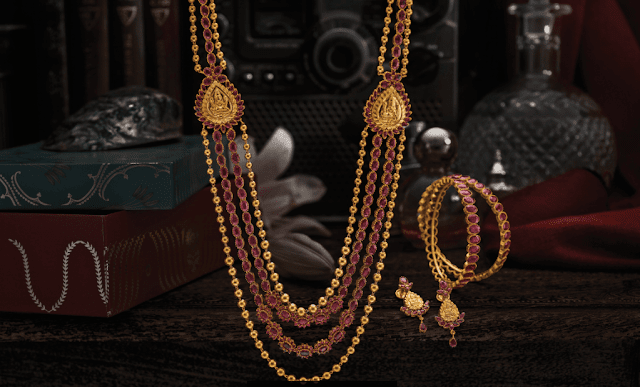 Starting with the first jewellery showroom in 1993, Kalyan Jewellers has enjoyed a long-standing presence in the Indian market for over two decades. It has set industry benchmarks in quality, transparency, pricing and innovation. 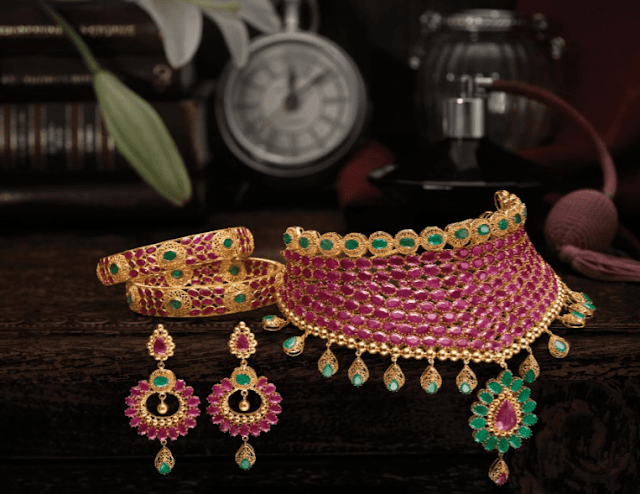 Kalyan offers an array of traditional and contemporary jewellery designs in gold, diamonds and precious stones catering to the distinct needs of the customers. 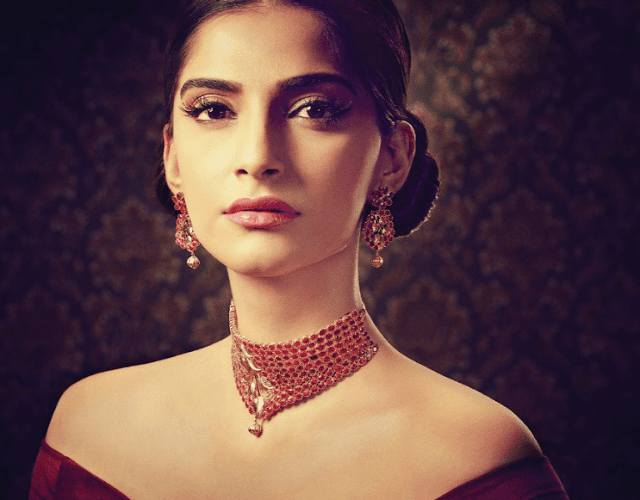 Kalyan Jewellers has grown to 104 showrooms across India and West Asia. Kalyan Jewellers continues to adhere to the founding principles of its forefathers of pursuing fair and ethical business practices.